BleachHouseLibrary.ie: "Missing Ellen" by Natasha Mac a'Bháird. This YA novel explores the boundaries between childhood and adulthood. There are many books about this period in a teenagers life, but not all of them get it right. There are moments when a young woman changes, not only physically, but mentally too. These moments can be hard to pin down, usually blurring the instances of first love, sexual awakening or desire for independence. Natasha Mac a'Bháird has taken an ordinary friendship, in an ordinary town, added in the (now common) separated parents and shown how a young, happy girl can become so unhappy that she becomes almost unrecognisable, to even her best friend. 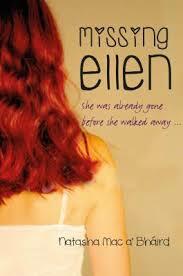 The departure of her father, and the new woman in his life, affects Ellen a lot more than she lets on. Her mother is in the depths of despair and is therefore not available to notice the change in Ellen. However, Maggie can see it. She tries to reason with her friend, but she is too angry, too bitter and is too far gone. Unusually, the school that the girls attend seem unaware of anything untoward and Maggie struggles to contain Ellen's wild side. The novel starts at the end; Ellen is gone and Maggie is writing her feelings down, diary style, sharing her dreams that Ellen is off somewhere having a ball. The writing is undercut with loneliness and guilt, with Maggie feeling uneasy about moving on without Ellen around. The author slowly reels in the reader, through clever technique and limited characters, meaning that the story of Ellen becomes part of our world, our narrative. There us a gaping hole in Maggie's world since Ellen left, but the beginning of that hole began with a crack. This novel shows how the smallest crack can become a serious fracture if not treated with care. I read this a while back - maybe a couple of years. A great coming of age story, my only reservation about it being the way Ellen and Maggie represented the extremes of teen behaviour; one so very bad, the other almost too good to seem real. Maybe it would have been nice to see someone 'inbetween'?